Release Date: January 26th, 2007 by Universal Pictures. 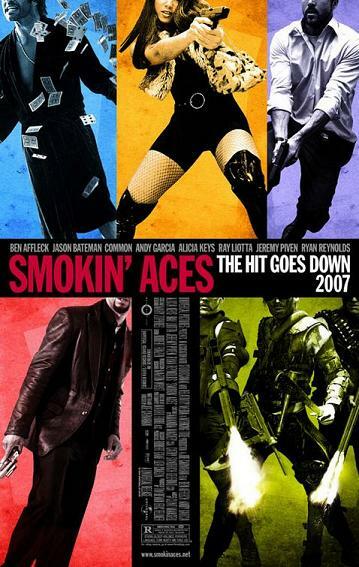 The Cast: Ryan Reynolds, Jeremy Piven, Ray Liotta, Ben Affleck, Andy Garcia, Jason Bateman, Peter Berg, Common, Alicia Keys, Nestor Carbonell, Martin Henderson. BASIC PREMISE: Buddy “Aces” Israel gets into trouble when he (Piven) turns in evidence to the FBI against the mob. ENTERTAINMENT VALUE: Jeremy Piven plays the unlikable, unmemorable role of Buddy “Aces” Israel, a magician who the mobs want to kill for being an informant to the FBI. The other actors seem like they’re there mainly to cash in a paycheck, namely Ray Liotta and Ryan Reynolds as an FBI agents and a bail bondsman play by Ben Affleck. The minimal plot feels very tedious and lacks any suspense. To make matters worse, writer/director Joe Carnahan steals heavily from the ultra-stylized violence found in Pulp Fiction and the hyper cinematography of Lock, Stock and Two Smoking Barrels or the recent Crank but fails to add any refreshing qualities of his own. If only Samuel L. Jackson were cast to diminish all of the dullness. At least Pulp Fiction had a great script with unique characters and memorable lines. This, on the other hand, is just loud, mean, annoying, confusing and repulsive from start to finish.